Interview conducted on June 27th, 2018, by Jeff Epstein, Editor-in-Chief of Citizens’ Media TV. Article copy edited by Ben Szioli. Added a “getting started with modern money” resources section at the bottom. July 4th: This article has been republished by Naked Capitalism, with amazing feedback from its members. Thursday, July 12th: Rewrote the final paragraph, regarding how to respond to politicians who turn to pay-for question onto their constituents. Also added corrections regarding Social Security in general and eliminating versus suspending FICA taxes. Friday, July 13th: added a correction about driving the currency. On Wednesday, June 27th, 2018, I had the honor of teaching the basics of modern money to progressive media figure Graham Elwood. Elwood is a stand-up comedian and semi-regular guest on The Jimmy Dore Show. He is currently on tour with Ron Placone, who is a guest on most of Dore’s shows. Elwood‘s show, The Political Vigilante, reaches tens of thousands, Dore’s reaches hundreds of thousands, and the main show on Dore’s network, The Young Turks, reaches millions. Here is a link to the full transcript of our interview. All of these truly progressive media outlets (along with Kyle Kulinski, Lee Camp, Caitlin Johnstone, Jen Briney of Congressional Dish, and many others) preach for and against exactly the right things, in exactly the right manner. They clearly and precisely describe how and why our current system is wrong and, just as clearly, what it can and should be. Where they fail however, is when it comes to how we will pay for these programs and how federal taxes fit into the picture. That we bring up the “pay for” question at all reflects a fundamental misunderstanding of how our economy works. None of this, of course, is done with sinister intent, it is simply what most of us believe to be accurate and true. Members of the progressive media – and to be sure, the vast majority of progressives, as well as all Americans – have been miseducated for their entire lives. These incorrect, misleading, and time-wasting concepts have been rammed into our brains for decades upon decades by our government, media, and education system. We therefore demand things from a position of ignorance and continue to waste our time on pointless endeavors. That is why the powerless will never get the programs that they need to survive. The progressive movement’s leaders and media figures have the eyes and ears of millions. Until we learn modern money, the progressive movement will never be more than a thorn in the side of the Democratic Party. We are sabotaging ourselves with a Sisyphean task. At best, we are getting nowhere. Bernie Sanders taught us that money in politics is the root of all evil. His incessantly repetitive and beautiful stump speech taught us step-by-step why and how this is true. Like putting on glasses after a lifetime of blurry vision, for the first time, we are now able to see the world as it could be. What Bernie did not teach us, however, is how to actually get these programs. That’s where modern money comes in. Modern money is no less profound, describing why we do not have programs for the powerless – and specifically why and how we can indeed have them. In fact, modern money shows that we could have had these things decades ago. 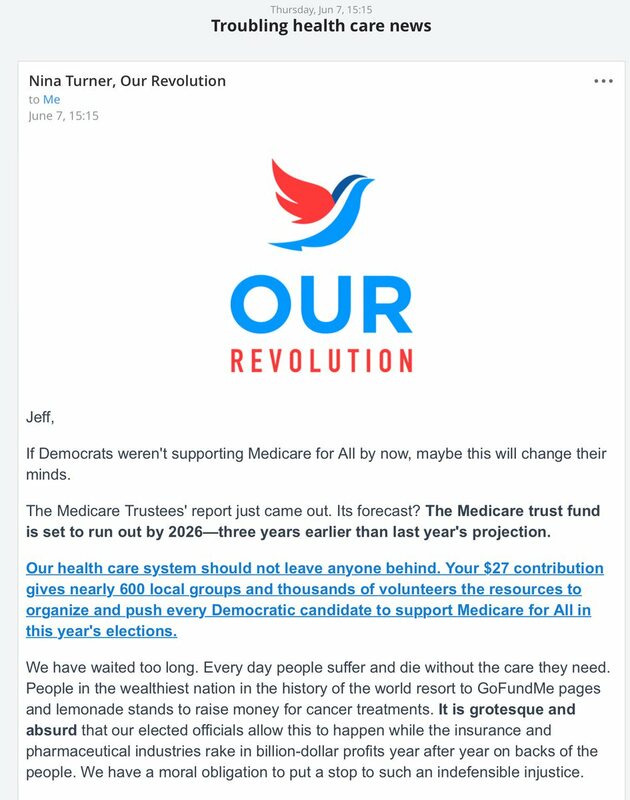 After learning modern money, we can finally do what we should have done long ago: organize and march onto the halls of Congress and demand Medicare for All, once and for all. When our politicians try to trap, trick, and distract us with the inevitable pay-for question (“Squirrel! !”), here is the only reasonable response: “We will pay for it by getting you out of office and replacing you with someone who will never ask that question again. They will do whatever it takes to get the job done.” From that point on, 100% of our energy and time must be spent making these politicians’ lives a living hell until they give us what we demand – what we need to survive — or get out of office. This lesson is geared toward those who know nothing about modern money – those who don’t even realize it’s a concept, let alone a profoundly important one. Most of the challenge in teaching the initial concepts of modern money is first discarding the incorrect knowledge. This takes time. This lesson is not intended to teach the deeper nuances and intricacies of modern money. It is only meant to get those who have spent their entire lives miseducated to open their minds to modern money. All these corrections are from my own #MMT teachers, who watched this whole lesson and walked me through each problem. Subsequent versions will be corrected, but none will be as special as this initial version with Graham. Overall, this initial lesson remains solid. Inflation is when every single product in the nation goes up & up in price. It is not inflation when the prices in a single industry (and even its ancillary or related industries) rise. It is not correct to say “a trillion dollars of gold.” It is correct to say “3,000 tons of gold, which the government decides can be exchanged for a trillion dollars.” Gold can only have weight. It’s value is a human decision. That society first bartered & that commerce was “overtaken” by a governmental currency is not historically accurate. Governments throughout history have immediately imposed their currency with taxes in order to force the populace to do what it needs (defense, construction, etc.). The Social Security Administration (SSA) does not issue the currency. The SSA determines, based on the 1935 Social Security law, what each beneficiary should receive each year. This amount is communicated to the Treasury who creates the currency and delivers it to beneficiaries. Given this is the case, it is clear that it is impossible to “steal” from Social Security. The only thing that could reduce benefits is for the SS law to be amended by Congress, requiring the SSA to inform the Treasury of ever-decreasing amounts. The purpose of taxes is to “drive the currency and drive the economy.” That is, force people to use the United States dollar. Taxes can be used to impose moral decisions and as a tool to control inflation, but driving the currency is its purpose. Thanks to Kathleen Trambley for contributing to this lesson, especially with the concept of war bonds. Thanks to Kim Niles for being a guinea pig with a very primitive version of this lesson. Thanks to Steve Grumbine and Real Progressives for accepting me into their group, and to its many members whose feedback helped greatly improve this lesson. Thanks to Ellis Winningham, Director of Economic Policy for Real Progressives, for the detailed feedback. CitizensMediaTV’s Twitter thread rant about how the progressive media gets modern money wrong. Website filled with modern-money aware articles and daily links: Naked Capitalism. Many modern money resources at We Can Have Nice Things. Stephanie Kelton (Twitter: @StephanieKelton). Bernie Sanders economic adviser first 2016 campaign and Chief Economist on the U.S. Senate Budget Committee (minority staff) in 2015. Email, Twitter, Facebook, Website, Basic MMT Twitter tutorial, all modern money related articles and interviews. Next Post: Transcript: Teaching Graham Elwood modern money, and how the progressive media gets it wrong.